The trucking industry expressed support and relief that Canada has agreed to a new trade deal with the United States and Mexico which, if approved by Congress, will replace the North American Free Trade Agreement. President Donald Trump presented what he called a “modernized” and “rebalanced” trade pact this week after days of intense negotiations between the Office of the U.S. Trade Representative and Canadian Foreign Affairs Minister Chrystia Freeland. 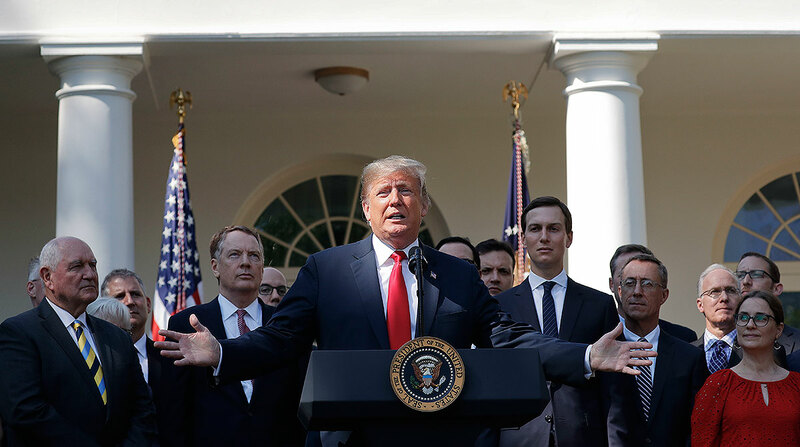 The United States struck a deal earlier with Mexico and set a deadline of midnight Sept. 30 for Canada to become a party to what is now called the U.S.-Mexico-Canada Agreement (USMCA). The new agreement requires 75% of auto content to be produced in North America, an increase from 62.5% under NAFTA, but does not address U.S.-imposed tariffs on steel and aluminum from Canada. On the possibility of tariffs on automobiles, light trucks and auto parts produced in Canada, the United States promised to exclude annually a quota of 2.6 million passenger vehicles or light trucks, or up to $32.5 billion in declared value for auto parts. The deal also includes a change in Canadian regulations that will allow greater access for U.S. dairy products, eggs and poultry. For Canada and Mexico, the agreement updates rules regarding data sharing and protection of intellectual property, and both countries agreed to raise the minimum shipment value of small packages shipped across the border that are subject to duties or taxes, a change that is expected to spur more e-commerce. Another provision gives the United States the right to limit access for longhaul truck drivers from Mexico. U.S. and Canadian trucking officials expressed support for the new trade pact. American Trucking Associations President Chris Spear called the new pact “a positive step” in preserving a 25-year-long tradition of free and open trade in North America. Canadian Trucking Alliance President Stephen Laskowski said he also is pleased that the new trade agreement was reached. National Tank Truck Carriers President Dan Furth said he is hopeful that the agreement will lead to the elimination of tariffs on Canadian exports of steel and aluminum, which have raised costs for trailer manufacturers. “I believe that getting this deal across the finish line creates optimism for important trade discussions further on down the road,” Furth said. Brett Doney, president of the Great Falls Montana Development Authority, said he expects to see an increase in investment by Canadian companies in the United States after implementation of the deal. “We see significant opportunity to work with Canadian firms in the energy and agriculture sectors,” Doney told Transport Topics. Recent moves by Canadian firms include a steel fabrication plant, an aircraft painting operation and a livestock nutrition sales and service center. Another Canadian company has agreed to buy land in Great Falls for an egg processing facility. Jon Samson, executive director of the Agriculture & Food Transporters Conference, an affiliate of American Trucking Associations, said the agreement will have a positive impact on the dairy industry. A key feature of the new trade pact is that it maintains an existing mechanism for dispute resolution and does not include a U.S.-supported proposal to automatically terminate the agreement after five years. The agreement includes a 16-year sunset provision, but the three countries will meet every six years to decide whether to renew the pact, which potentially keeps the agreement going in perpetuity, according to ATA's Costello. “These are victories for the U.S. business community,” Costello stated. USMCA also would establish a committee to monitor and make recommendations related to transportation services.